Enable the OpsCenter Performance Service. Enabling each performance object also enables its default configuration. Disabling the OpsCenter Performance Service is recommended during peak production time. Note: The Slow Query Log is enabled by default in the OpsCenter Performance Service based on the default settings in DataStax Enterprise (DSE). When enabling or disabling the OpsCenter Performance Service, the JMX interface is used to immediately toggle the Service. This behavior is the same as when using the dsetool perf command to temporarily change the running parameters for the DSE Performance Service. For clusters not managed using Lifecycle Manager (LCM), OpsCenter programmatically sets a value in dse.yaml, which causes the file to lose comments and formatting. If there are comments and formatting you want to retain or refer to later, back up the dse.yaml file for safekeeping. Important: If a cluster is being managed within LCM, OpsCenter does not automatically modify dse.yaml for the Performance Service. 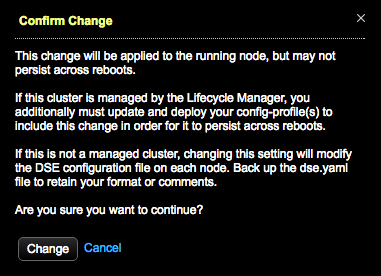 You must manually update the associated settings in the configuration profile for the cluster in Lifecycle Manager. The Overview page prompts you to enable metrics. Click the Enable metrics link to view performance data. The Settings tab appears where you can enable and configure the performance objects. Click the toggle in the Status column to On for the performance objects you want to enable. The performance objects can be turned on and used independently. Turning on a performance service object enables the associated settings in the dse.yaml file. For clusters not managed using LCM, changes are pushed to dse.yaml on every node, which overwrites any comments or formatting in the dse.yaml file. To retain your original dse.yaml, make a backup of the file as mentioned in the above prerequisite. For clusters managed using LCM, you must manually update any configuration profiles to persist changes to dse.yaml related to the performance service. See Editing a configuration profile.